Things are certainly going to get bloody when this thing hits the board, as a 3/1 lifesteal can’t be ignored. Your opponent will likely be forced to trade if they want any chance to race, and there are so many surveil cards (28, to be exact) that it won’t be hard to bring this back a few times per game. 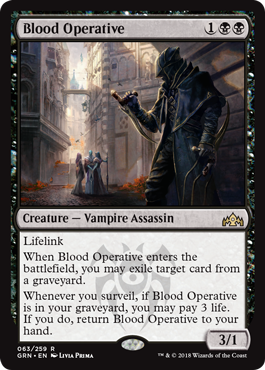 With multiple common Auras that lock this down, don’t be afraid to use one of your removal spells on your own Blood Operative if you have ways to get it back.